The Enbridge Line 5 crude oil pipeline runs from Superior Wisconsin to Sarnia, Ontario. Line 5 is a 30 inch diameter crude oil pipeline that is split into two 20 inch diameter pipelines at the North Straits Pump Station near St. Ignace. The two 20 inch diameter pipelines proceed under the Straits of Mackinac about 1,000 feet apart reaching depths of 200 feet before reemerging in the lower peninsula. The pipeline was commissioned in 1953 and has been in service for over 62 years. 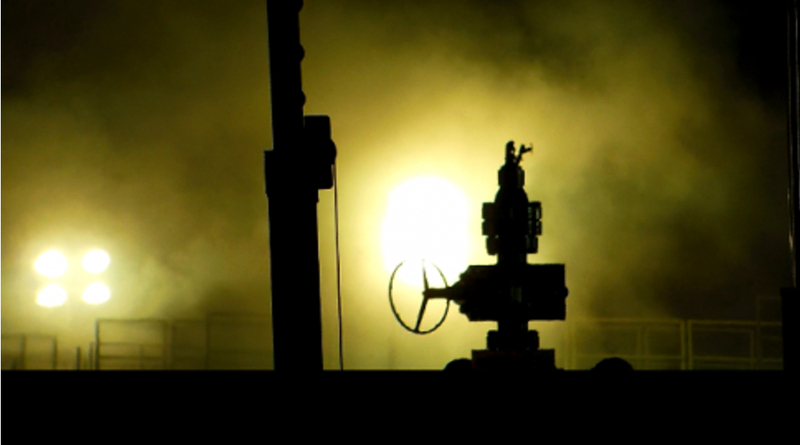 As of December 2013, Enbridge increased the capacity of Line 5 to pump 540,000 barrels of crude oil per day. This is 50,000 barrels of oil more per day than its previous capacity of 490,000 barrels of oil per day. RMP has created an interactive “Line 5” Google Map that is embedded at the very bottom of this post if you want to skip right to the map! The North Straits Pump Station is located about 100 yards from the Straits of Mackinac on the northern shore of Lake Michigan at Point La Barbe in the upper peninsula. The North Straits Pump Station is the last landmark of Line 5 before it dives into the Great Lakes freshwater system. Click any picture in this post to enlarge it and open a photogallery. Enbridge Line 5 has recently been receiving more attention than it has in the past because the aging pipelines under the Straits of Mackinac present a major regional economic risk and an environmental risk to the Great Lakes freshwater system. Line 5 puts the Great Lakes freshwater system at risk of a cleanup that could potentially surpass the one billion dollar mark. Economic losses could also occur in tourism and other industries that depend on the Great Lakes freshwater system staying clean and pure. Any potential cleanup could be even further complicated and costly if it were to occur with the Straits covered in ice. Even though the world demands oil for our oil powered cars, oil is technologically obsolete with the advent of Fuel Cell Electric Vehicles like the Toyota Mirai which launched in California in October of 2015. While we may be dependent on oil for years to come, the time to start a responsible migration away from oil as an energy source is now. Certain oil infrastructure, like Enbridge’s Line 5, should be the very first oil infrastructure that is shut down forever. 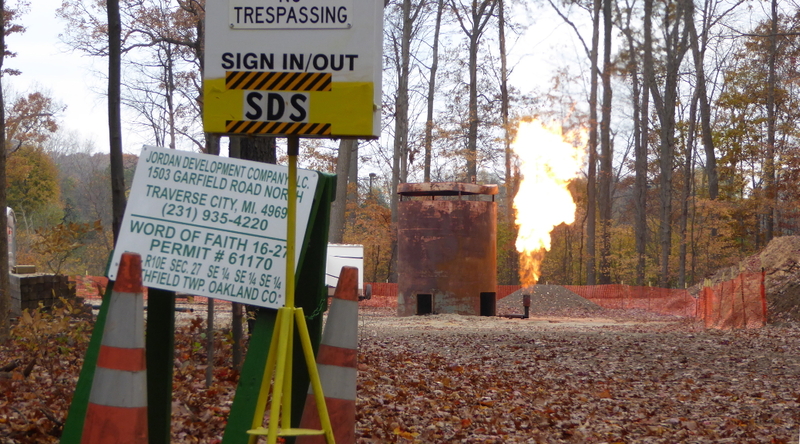 The environmental and economic risks in place while Line 5 continues to pump a technologically obsolete energy source represent failed economic policy for Michigan taxpayers. The majority of oil pipelines, however, cannot be retired from service as long as we continue to depend on ICE powered vehicles. Until people act on advancing the adoption of fuel cell electric powertrains for our vehicles, oil pipelines will persist; you simply cannot have one without the other. 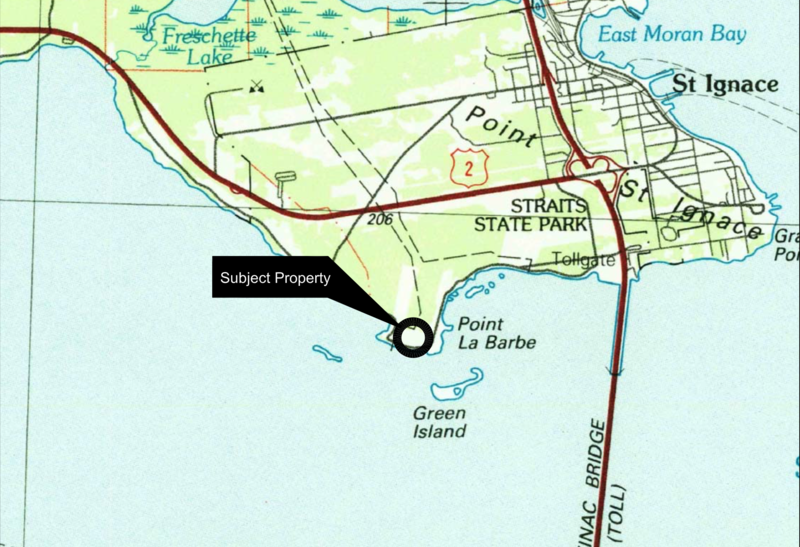 RMP would like to detail a Line 5 crude oil leak that happened less than 100 yards from the Straits of Mackinac on the northern shore of Lake Michigan at the North Straits Pump Station. In this post, we will examine how the spill was discovered, how the Response Action Plan (RAP) has been handled so far, the RAP’s timeframe and methodology, what conclusions we can draw, and we will contemplate some questions that seem reasonable given where we are today in December of 2015. 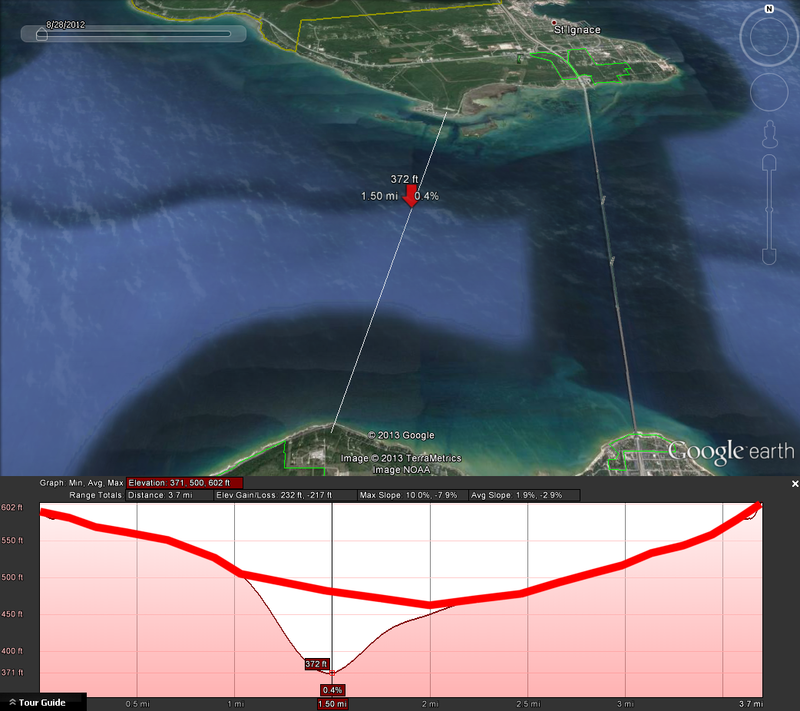 One and a half miles off the north shore of Lake Michigan on the Straits of Mackinac, Line 5 must span a chasm shaped like an upside down bell that reaches a depth of 372 feet. Zebra Mussels first introduced to the Great Lakes freshwater system in 1985 from ballast water in Lake St. Clair add weight to this section of Line 5 that it was never intended to carry. 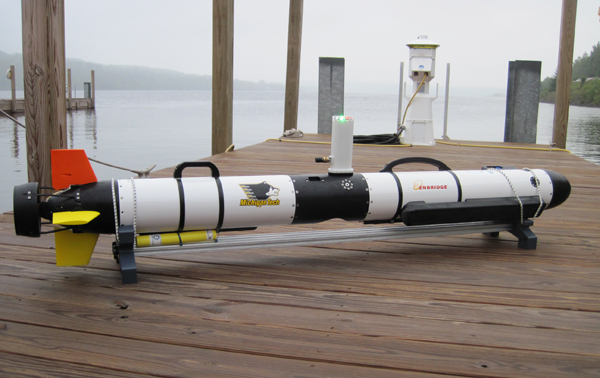 We often hear of high-tech equipment that’s in place around oil pipelines that will immediately notify officials who can quickly activate shut-off valves that will stop the flow of crude oil in a compromised section of pipeline. We hear these assurances all the time, but in reality we often find that an alert hunter, farmer, fisherman, or passerby discovers the oil spill by happenstance and notifies the pipeline operators who’s high-tech equipment failed to do anything. That’s what we had at Tallmadge Creek near Kalamazoo recently when Michigan was home to the most expensive inland oil spill & clean-up in United States history. The spill at the North Straits Pump Station is not too much different from many spills in that it was discovered haphazardly rather than by any fancy equipment which reminds us to always keep a wary eye on Line 5. On May 18, 2011 soil excavation activities occurred at the North Straits Pump Station for infrastructure maintenance and construction activities. From the outset of excavation activities, groundwater was encountered and pumped 50 feet north of the excavation site to the ground surface and discharged into an area with hay bales forming a square shape that acted as a simple filtering mechanism to remove suspended solids from the ground water. Within one day (on May 19, 2011) a strong petroleum odor and oil sheen were observed on the hay bales that were acting as a crude filter. 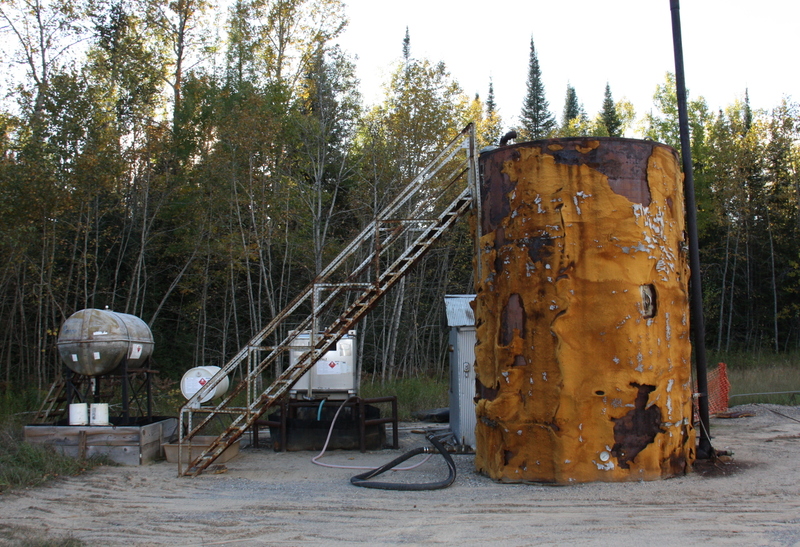 An activated carbon based filtration system was delivered to the site by ProAct Services Corporation of Ludington, Michigan immediately (May 20, 2011) upon discovery of the petroleum contaminated ground water. Because historical petroleum contamination was discovered, it was necessary to request an authorization to discharge treated water with a Wastewater Discharge permit under MDEQ requirements. 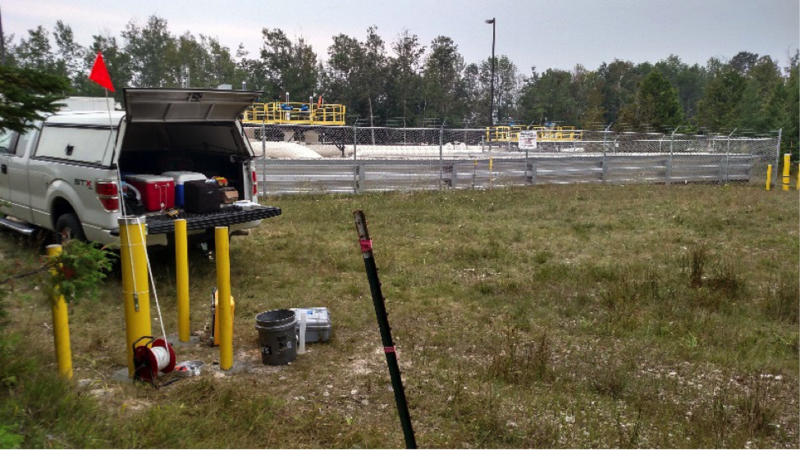 This is the first time the MDEQ was notified of petroleum contaminated groundwater at the North Straits Pump Station. 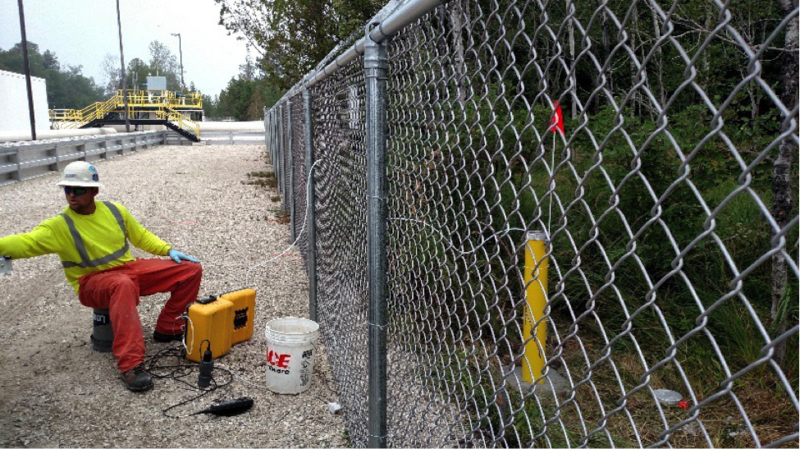 The soil being removed during excavation activities in May of 2011 was screened with a photoionization detector (PID) and anything with a PID reading higher than 5.0 ppm was stockpiled for offsite disposal. Any soil less than 5.0 ppm was used for backfill in the excavation area. Elevated PID readings were detected at the base of excavation (6 to 8 feet below ground surface, within the saturated soil) in the vicinity of the incoming valve (43.6 ppm), the receiving trap (225 ppm), and the west line sending valve (25.3 ppm). Based on the PID screening, 361.1 tons of excavated soil had to be removed and trucked off to the Dafter landfill for sanitary disposal and virtually no soil in the impacted areas was eligible to remain on site. Two grab samples of the soil stockpile were collected for VOC’s along with one for PNA’s. Maximum detections for VOC’s were 500 µg/kg for 1,2,4 TMB, 300 µg/kg for 1,3,5 TMB, 1300 µg/kg for 2-methylnaphthalene, and 340 µg/kg for xylene. PNA’s detected include 350 µg/kg for chrysene, 910 µg/kg for fluoranthene, 710 µg/kg for phenanthrene, and 700 µg/kg for pyrene. A detailed report about soil excavation and petroleum contaminated groundwater would be released by Leggette, Brashears, and Graham Inc. in the summer of 2012. MDEQ/RRD notes related to the contamination incident lament the use of an air knife to collect soil samples for VOC analysis in July of 2012 which is about a month earlier than LBG’s publication report date. The MDEQ wrote a District Peer Review Approval & Tracking form signed on July 29, 2015 about air knife soil sampling stating that an air knife should not have been used because in the words of MDEQ/RRD Project Manager Scott Schaefer, “Enbridge policy requires use of alternative methods for soil borings in areas with critical infrastructure”. The North Straits Pump Station is considered critical infrastructure given its close proximity to the Straits of Mackinac. RMP does not know how actively involved the MDEQ was with site visits and recommendations or demands for intensive monitoring but it wasn’t until October of 2013 that 4 new groundwater monitoring wells were installed at the site and sampled for VOCs since the original discovery of the spill. We also don’t know who called for the groundwater monitoring wells or why it took more than two years for them to be installed. In Enbridge’s groundwater monitoring report made in October of 2013, it was determined that ground water flow was to the north but this does not jive with common sense. How can a shoreline facility have a groundwater flow away from Lake Michigan and the Straits? It does not make sense and in fact would be determined scientifically false years later in 2015. Given the critical location of the North Straits Pump Station, it seems reasonable to expect a certain urgency to respond to a crude oil spill. It wasn’t until January 5, 2015 that the MDEQ’s RRD division sent a letter to Enbridge requesting a Response Activity Plan (RAP) as provided for in Section 14(1)(h)(ii) of Part 201 to undertake additional evaluation activities. As of January 5, 2015 it had been more than 3.5 years since the spill was originally discovered. The spill’s actual cause, occurrence date, and amount of crude oil spilled is still not determinate at the time of this publishing as far as RMP knows. Nowhere within the documentation obtained by RMP does the MDEQ’s RRD call for an investigation of how the spill occurred originally or how much crude oil was spilled. We do not know for sure what caused the release of crude oil other than it is assumed to have occurred around the incoming receiving trap, the former location of the incoming valve, and the west sending valve based on the PID readings observed during soil excavation. It is also difficult to know the MDEQ’s direct involvement in onsite activities and monitoring of the spill or the cleanup activities. The original spill discovery and cleanup activities related to treating contaminated ground water and removing contaminated soil in 2011 & 2013 are noted to have been “Enbridge self-implemented response activities” according to the report commissioned by Enbridge and written by Superior Environmental Corp. Enbridge’s Karl Beaster received an email from the MDEQ’s RRD Project Manager Scott Schaefer on July 24, 2015 regarding the RAP where Scott says “I was assuming you were going to self-implement this work and were providing us with a copy of what was going to be done.” Because Enbridge self-implemented the remedial activity in 2011 & 2013 and Scott is assuming that the upcoming 2015 activity will be self-implemented as well, it is hard to tell from the documentation made public to determine the extent of the MDEQ’s onsite presence and direct observations of events that have transpired between May 18, 2011 and today. The MDEQ received Enbridge’s RAP documentation on July 29, 2015 and approved it on July 30, 2015. 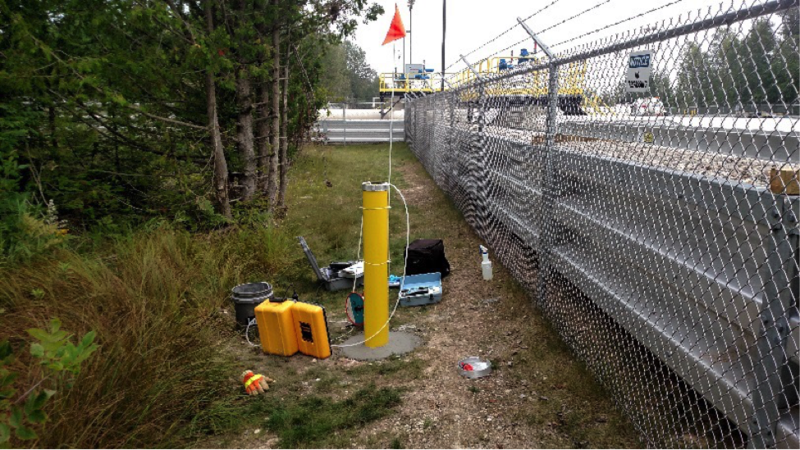 Between August 31, 2015 and September 2, 2015, Superior Environmental Corp completed a subsurface site investigation to assess the soil and groundwater compared to current Generic Residential Cleanup Criteria (GRCC) established by the MDEQ-RRD. Superior’s final report was published November 12, 2015. The detailed report from Superior Environmental Corp notes that the original contamination discovered in 2011 was from “areas of historical releases from routine maintenance”. If crude oil is being released within 100 yards of the Straits of Mackinac is routine, then the routine is unacceptable; this is especially true if the release occurring was going on undetected and the times and quantities of the crude oil spill are indeterminate. Each of the nine (9) soil boring samples (SB) were reported non-detect for VOCs. For PNAs, the boring samples SB#1, SB#2, SB#4, SB#8, and SB#9 were reported as non-detect. Soil analytical results at SB#3, SB#5, SB#6, and SB#7 resulted in detections above reporting limits. Benzo(b)fluoranthene was detected in soil samples SB#6 & SB#7 above reporting limits. Phenanthrene was detected in soil samples at MW-7 above reporting limits. The latest documentation available to RMP, the report published by Superior on November 12, 2015, is most likely still under review at the time you are reading this post. The MDEQ must contemplate carefully its next steps given the heightened awareness around Line 5 in the newspapers and twittersphere. RMP has created an interactive map that is embedded at the end of this document so you can better understand the geography discussed in this post. Our maps are regular Google Maps so feel free to zoom in and out and click on the markers and polylines to get a visual representation of the information submitted in this post. Line 5 Pipeline at the Marysville Hydrocarbons facility. Marysville, Michigan is near Port Huron and very near the St. Clair River where Line 5 crosses from the U.S to Sarnia, Canada. RMP has consistently advocated for the responsible migration away from crude oil as an energy source. We have demonstrated with facts and figures repeatedly how crude oil as an energy source is technologically obsolete and has a net negative benefit for the US economy in both the short and long term. Certain oil infrastructure will be necessary to maintain & keep operational as we work to responsibly phase oil out of our energy mix. Enbridge’s Line 5 is an example of oil infrastructure that simply does not make economic or environmental sense for Michigan taxpayers. Line 5 does not provide Michigan with economic benefits or jobs that offset the risk of a Mackinac Straits pipeline failure. RMP is cognizant that Line 5 supports the economy of Sarnia and people in Canada’s chemical alley. Line 5 also supports American jobs in Marysville Michigan at Marysville Hydrocarbons. RMP never wants to see working people out of a job and we do not advocate for the decommissioning of Line 5 with the intent of hurting our hard working friends in Michigan or Sarnia or anywhere else. It is not easy to advocate for a position that could affect people’s way of life. But, in the case of Line 5, it is time to be responsible for the greater good. We must negotiate with our Canadian neighbors to find an alternative means to allow the people of Sarnia to continue their manufacturing work. Our elected officials need to find a way to reinvent how our energy infrastructure can benefit all of us with jobs and energy without the risk of an oil spill or putting our Great Lakes at risk. That’s what good leaders do, they lead us to better economic solutions than we have today. We call attention to the risks posed by Line 5 in this post by demonstrating the leak and spillage at the North Straits Pump Station. RMP believes it is important for the taxpaying public to know about all energy infrastructure that causes economic, social, and environmental risks to our public lands and waters. You may feel free to attempt to request more information about the North Straits Pump station RAP that is currently ongoing but your FOIA requests may be denied. 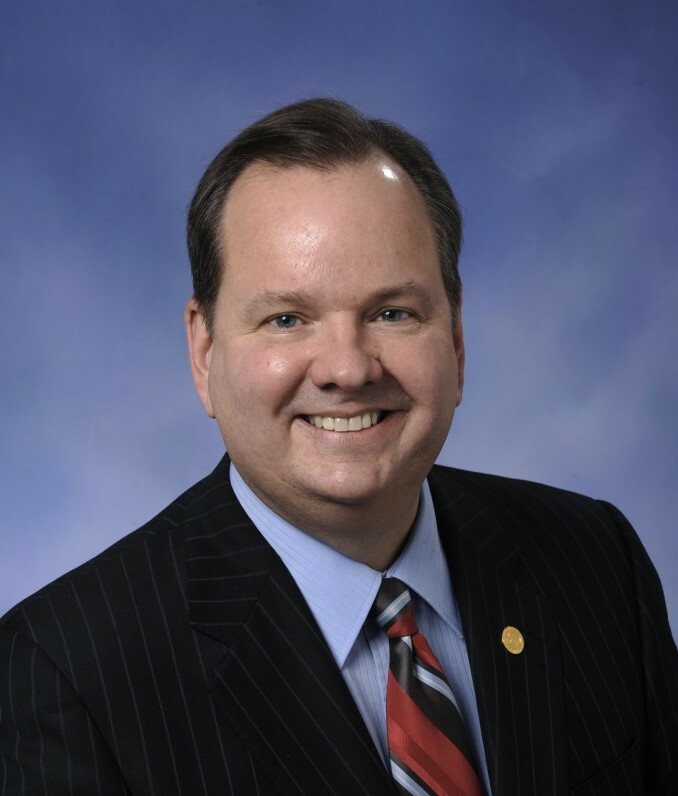 State Representative Kurt Heise is sponsoring bill HB4540 that erodes our first amendment rights to freedom of information and freedom of press. Kurt Heise, State Representative of Plymouth’s District 20, is sponsoring legislative bill HB4540 to deny taxpayers the freedom to request information about energy infrastructure. Kurt’s legislation has a stated purpose of protecting the public from terrorism but it doesn’t meet common sense tests. Kurt says that by denying our freedoms to pipeline inspection records and contamination plumes caused by faulty oil wells, like the information you read about on this website, it will protect us from terrorism. Anyone with an internet connection can find our critical energy infrastructure and know its precise location to attack it; a terrorist does not need inspection data to plan an attack. In essence, Kurt’s legislation is an erosion of our first amendment rights. Kurt’s bill infringes upon our freedom of press and abridges our freedom of speech. Kurt’s bill is fear mongering for some other purpose than the face value of the legislation. Res ipsa loquitor. In fact, there is great irony to Kurt’s fear mongering in his reference to terrorism. We have demonstrated with facts, figures, and information from very reputable sources (e.g. the EIA) for many months on this website that oil is both directly and indirectly connected to funding terrorism. Billions of dollars flow daily out of our pocketbooks to countries that sponsor terrorism and cause US trade deficits. And, instead of writing legislation that can move us more quickly toward 100% energy independence, we must deal with bill’s like Kurt’s that ironically help terrorists and move our energy sector backward and into the dark. The Honda FCX Clarity is the latest mass produced FCEV by the Japanese automaker. It will hit the market in early 2016. 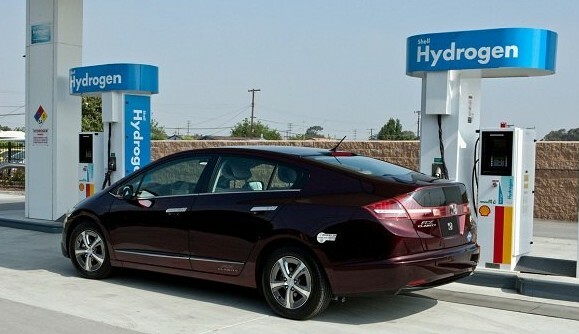 Hydrogen fuel cell cars can be powered by water or garbage or just about anything. We can create jobs and energy right here in Michigan and do away with oil pipelines. The future is now. If we want to stop terrorism, we should cut off its funding by responsibly migrating away from crude oil as an energy source. A tried and true strategy of Kurt’s political party is to not attack what is bothering them head on, but rather to simply cut off the source of funding for what they consider a problem. This strategy has served his party very well: cut off the funding and the problem just goes away. If Kurt is serious about protecting America and Michigan from terrorism, why not employ the same strategy: cut off the funding to terrorists by supporting energy that does not come from countries that support terrorism. You can speak up to take a stand against Kurt’s ignoble legislation by using this tool created by the Michigan League of Conservation Voters to send a letter to your State Representative asking him or her to say no to HB4540. Help stop HB4540 if you want to take steps toward defunding terrorists with oil revenue from our hard earned dollars. The Department of Energy announced December 3, 2015 that Colorado is now the sixth state to join the Fuel Cell Electric Vehicle race. California, Hawaii, New York, Connecticut, New Jersey, and now Colorado make up the top 6 states that are moving the needle on making the Hydrogen Economy a reality. By using hydrogen to power our grid, we can not only decentralize it to make it safer from terrorist attacks, we can power it with water, wind, solar, and waste. We can power everything we use with domestic energy while creating jobs. No more burying our garbage in the dirt, but using that garbage instead of oil to power our cars. Think about it. France’s first public H2 filling station was inaugurated in Paris on December 7, 2015 to coincide with the COP21 conference. A fleet of clean energy FCEV taxis will work the streets of Paris demonstrating the coming of the Hydrogen Economy to Europe. Hydrogen can be made from water or garbage or sewage or just about anything and an FCEV’s only tailpipe emission is pure water. Major cities like London, Tokyo, Seoul, Berlin, Aberdeen, and Los Angeles have shown their commitments to the Hydrogen Economy and demonstrated themselves as leaders in sustainable energy and common sense economics. 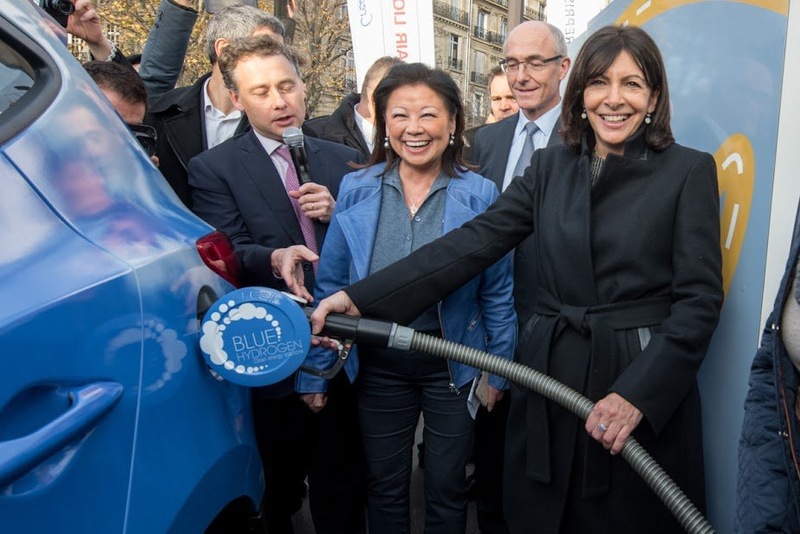 This month Paris, France joins the march toward the Hydrogen Economy by unveiling their first H2 fueling station during the COP21 conference. Detroit still sits on the sidelines as these world leading cities show their commitments to our clean energy future while Michigan legislators try to move our energy policy backwards and into the dark. Detroit has always been known the world over as the famous Motor City. Let’s work to keep the name The Motor City alive and well and join other world leading cities and states by adopting legislation that supports H2 infrastructure for the next generation of automotive cars, trucks, busses, trains, marine vessels and airplanes. Fuel cells can also power our homes, hospitals, factories, and all residential and industrial entities. RMP will continue to beat our drum of how to fix our economy and environment by adopting smarter energy legislation like supporting fuel cell electric vehicles. Remember, as long as our cars are powered by gasoline, oil pipelines will persist and funding will flow to jihadists and hostile countries; the economics of oil are really that simple. Want to support water conservation, our economy, and take steps toward ending terrorism financing? Then support legislators like those in California, New York, Hawaii, Connecticut, New Jersey, and now Colorado; legislators that are putting forth legislation that will make America energy independent and simultaneously stop the flow of cash to countries that sponsor terrorism and foment war with our allies. The map below is our first map specifically designed for this post. It’s a fully interactive map of the Enbridge Line 5 crude oil pipeline. You can zoom in zoom out and see what you want to see. 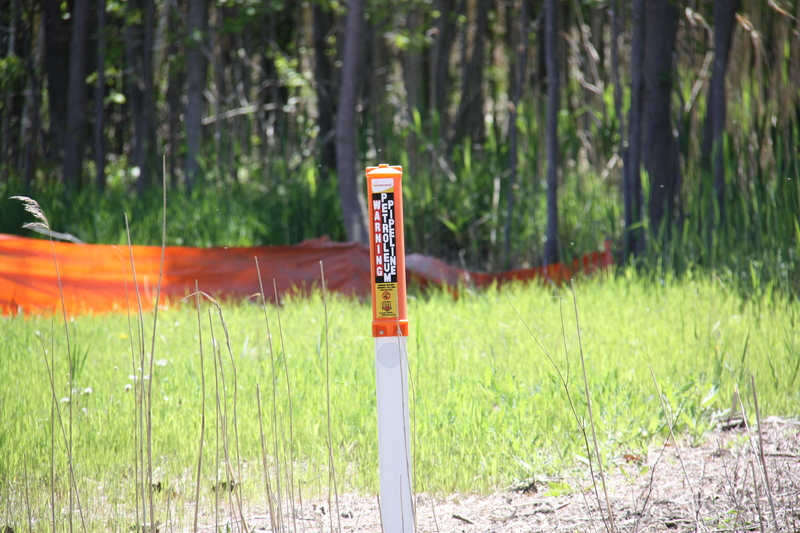 RMP has added markers for the soil boring samples and groundwater monitoring wells at their exact locations at the North Straits Pumping Station. Try clicking on them and reading more about them. There is no map on internet that let’s you explore Line 5 like RMP’s interactive map below. And, our maps are always evolving. As we get more information, we can add it to the map and make it better. My recommendation is to the click on the “Click Here To Open Full Screen Map” link so you can use your entire monitor to get full screen and maximize the width of your monitor. Go ahead, zoom in on Superior Wisconsin or Sarnia Ontario and learn more about Line 5. Leave us a comment and let us know what you think or if there’s anything we can add. Our maps are always getting better and you can expect more individualized maps like this one that help support the stories we tell. This is our first “Geo Blog” post and we have a lot more in store for you. Please consider clicking here to make a donation to our organization if you want to help us get more valuable information to the public. We are a Michigan based 501(c)3 non-profit organization and your donations are tax deductible. Thanks! Two leaks in the Upper Peninsula to date is two too many. One flowed downhill and was ignited by the old style oil pots used in road construction. It caused a 100 acre fire that burned two people. Oil is like is a double edge sword to your environment and to our civilisation. It’s helping us live better lives but it is also killing us at the same time.